Over the past couple of weeks there has been no getting away from the hype cased by Microsoft and Sony following the recent launches of the next generation consoles Xbox One and PlayStation 4. Whether you’re a gamer or not, it is common knowledge the impact these consoles have on their appropriate markets and the influence they can have on so many people lives. So, where does this tie in with health and fitness? Well since the launch of the Nintendo Wii in 2006, emphasis has shifted to make gaming more than just holding a controller in your hands whilst sat in an armchair. For those who didn’t know the Nintendo Wii uses motion detectors, which allowed users movements the ability to control their action within the game. The possibilities this opened up were endless, and yes inevitably made its way into the fitness sector. So this leads us to today, seven years on and the latest consoles have been release along with their top of the range motion detectors installed and the market has grown rapidly. 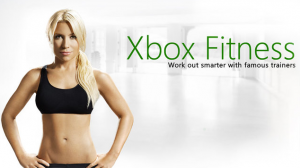 With the latest Xbox One, owners who posses an Xbox Live Gold membership can download for free the new Xbox Fitness app, which provides the best values available on the system. Now I’m definitely not saying go out and spend £500 on a console with the sole purpose of getting fit (especially when there are perfectly good roads out their) but for any keen gamers who fancy ‘killing two birds with one stone’ what better way to do it than in the comfort of your own home? The Xbox Fitness app, offers a variety of workouts ranging between 10 and 60 minutes in length and can also monitor your heart rate and calorie count. However if just completing minuscule gym movements isn’t for you, then you also have an option to choose specific sport related workouts. The Fitness app also offers gaming incentives which will help to drive you onto the next level of fitness. Although spending £500 to get healthy is not the right option, if you’re someone who likes to train on your own at your own pace, then it couldn’t be easier.